Today, the California and Missouri State Quarter Coins remember the great race beginning April 8, 1860 for the Pony Express to make 1950 miles in ten days. As the population of the Pacific Coast increased, the demand for quicker mail service became more imperative. The scheme of importing camels and dromedaries and using them in carrying the mail and express across the plains was agitated. It was claimed that the camel, filling his internal water tank out of the Missouri river, could strike straight across the waterless wastes of New Mexico and Arizona, stopping occasionally for a meal of sage brush, and taking a drink at the Colorado river, he could trot across the Colorado desert and deliver the mail in the California coast towns fifteen days from New York. As some of you will recollect, the camels did come to the coast in 1857, but they were not delivering mail; they were carrying freight, and were not much of a success at that. The Butterfield stage route was established in 1858. It was the longest stage line in the world. Its western terminus was San Francisco, and its eastern termini Memphis and St. Louis. It brought the eastern news in 20 days. “An important event in the history of St. Joseph, Mo., was the starting of the ‘Pony Express’ on April 3, 1860. The facts and incidents connected with this ride of 2,000 miles to San Francisco form a most interesting chapter in the story of early western progress. “In 1859 St. Joseph was the western terminus of railroad communication. Beyond the Missouri river the stage coach, the saddle horse and the ox trains were the only means of commerce and communication with the Rocky Mountains and the Pacific Slope, across a space now traveled by a dozen vestibuled trains daily. “In the winter of 1860 a Wall street lobby was in Washington trying to get $5,000,000 for carrying the mails one year between New York and San Francisco. The proposition was nothing more or less than an attempt to bunko the government. William H. Russell, who was then interested largely in freighting business on the plains, backed by the Secretary of War, resolved to give the lobby a cold shower bath. Russell offered to wager $200,000 that he could put on a mail line between San Francisco and St. Joseph that could make the distance, 1,950 miles, in ten days. The wager was accepted, and April 8, 1860, was fixed upon as the date for starting. “To accomplish this service. Miller bought 300 of the fleetest horses he could find in the West, and employed 125 brave and hardy riders. These men were selected with reference to their light weight and courage. It was highly essential that the horses should be loaded as lightly as possible, because some sections of the route had to be covered at the rate of 20 miles an hour. “The horses were stationed from 10 to 20 miles apart, and each rider was required to ride 75 miles. For each change of animals and the transfer of the United States mails two minutes were allowed. Where there were no stage stations at proper distances, tents capable of accommodating one man and two horses were provided. Indians, it was supposed, would sometimes give chase, but their cayuse ponies could make only sorry show in pursuit of Miller’s thoroughbreds, many of which could make a mile in 1 minute and 50 seconds. “All arrangements being completed for this great undertaking, a signal gun on a steamer at Sacramento proclaimed the meridian of April 8, 1860, the hour for starting. At that signal Mr. Miller’s private saddle horse, Border Ruffian, with a brave rider in the saddle, bounded away toward the foothills of the Sierra Nevadas. The first 20 miles were covered in 49 minutes, and this feat was repeated until the mountains were reached. The snows were deep in the mountains, and one rider was lost for several hours in a snow storm. After Salt Lake Valley had been reached, additional speed became necessary to reach St. Joseph in time. From there on, however, all went well until the Platte river was to be crossed at Jules- burg. “The stream was swollen and running rapidly, but the horse plunged into the flood, only, however, to mire in quicksand and drown. The courier succeeded in reaching the shore with his mail bag safe and traveled ten miles on foot to reach the next relay. The journey from this point to within 60 miles of St. Joseph was made quickly and without incident. Johnny Fry, a popular rider of his day, was to make the finish. Pie had 60 miles to ride, with six horses upon which to do it. When the last courier arrived at the 60-mile post out from St. Joseph, he was one hour behind time. A heavy rain had set in and the roads were slippery. “Fry had just 3 hours and 30 minutes, in which to win. It was the finish of the longest race and largest stake ever run in America. “When the time for Fry’s arrival was nearly up, at least 5,000 people stood upon the river bank, with eyes turned toward the woods from which the horse and its rider should emerge into the open country in the rear of Elwood, one mile from the finish. “‘Tick, tick!’ went hundreds of watches. The time was nearly up. Only seven minutes remained. ” ‘Hurrah !’ A shout goes up from the assembled multitude. The courier comes! A noble little mare darts like an arrow from the bow and makes the run of the last mile in 1 minute and 50 seconds, landing upon the ferryboat off Francis street with five minutes and a fraction to spare. “The story of this remarkable feat is only a scrap of history now. A few of the riders who participated in the great race are still living, and hundreds of old timers recall the scenes and incidents that marked the finish of the splendid contest against time. It was a great event in the history of St. Joseph. The rider at the western end of the route, who reached Sacramento April 13, 1860, was accorded even a more enthusiastic reception, although no bet was pending on the time of his arrival. The news of his coming was heralded with great enthusiasm, and both houses of the Legislature adjourned to welcome him. He came in time for the regular afternoon steamboat, and the horse and the rider, with the mail bag, just as they had come into Sacramento, took passage on the boat and arrived at the wharf in San Francisco at 1 o’clock on the morning of April 14th, with the mail, just 10.5 days from St. Joe. They were met by an enthusiastic crowd with a band and torches. A procession was formed; and with music and continuous cheers they were escorted to the post office. The quickest time ever made between San Francisco and New York by overland mail via the Butterfield route was 20 days. The Pony Express shortened this time to 10 days. 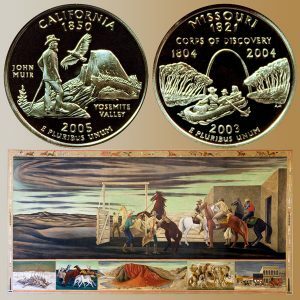 The California and Missouri State Quarter Coins show with a mural representing the Pony Express.